All over Flores there are bamboo forests, with plants reaching heights of over 30 metres. 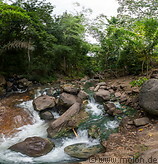 The Malanage hot springs is near Gunung Inerie south of Bajawa. Here, hot water from an underground spring mixes with the water of a small river and flows further down the hills. There are a number of pools where visitors can rest and take a bath. Facilities are quite basic, but there is no entrance fee. Mt Kelimutu is a volcano with an altitude of 1650m located in eastern Flores, between Ende and Maumere. Near the summit there are three crater lakes whose water changes colour over time. Mt Kelimutu lies in the homonymous national park (entrance fee: 150000 IDR).